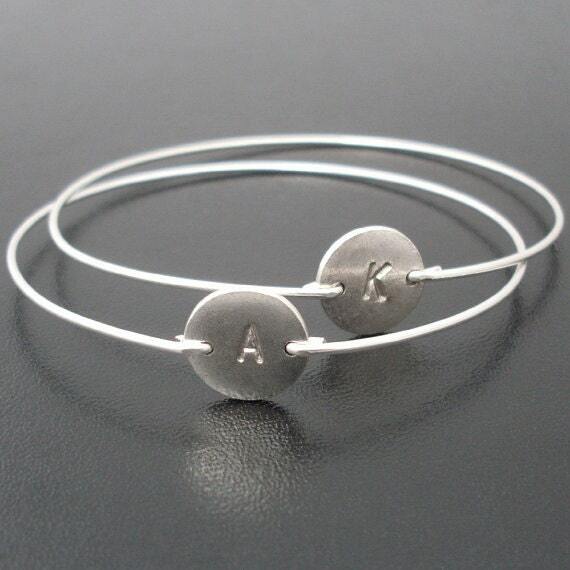 You & your best friend each get your own initial on the front of your bracelet and your best friend's initial as a secret stamp on the back of your bracelet. ♦ 1st Friendship Bracelet (This bracelet is for your best friend). I hand stamp your best friend's initial on the front PLUS a "secret stamp" of your initial on the back... Please mention choice of initials in "notes to seller" during checkout... Or if you don't want initials on the back please mention that too. ♦ 2nd Friendship Bracelet (This bracelet is for you). I hand stamp your initial on the front PLUS a "secret stamp" of your best friend's initial on the back. For a group of more than 2 best friends, you can each get your own initial on the front of your friendship bracelet, and the secret number of friends on back. For example, for a group of 3 best friends I can stamp BF3, or just the number 3 on the back. 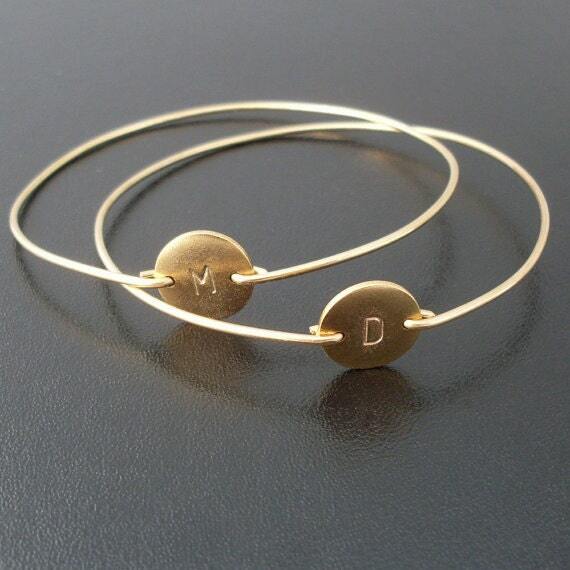 These dainty & delicate custom initial bangles make great best friends bracelets, whether it's a birthday gift for your best friend, or a surprise best friend gift anytime of year. Select gold friendship bracelets made with gold plated discs and choice of brass or 14k gold filled bangle bands... Or choose silver friendship bracelets made with silver plated discs and choice of silver filled or sterling silver bangle bands for your personalized best friend jewelry. Please specify size in "notes to seller" during checkout. Choose from one of my regular sizes below by measuring one of your favorite bangles, or give me the circumference of the widest part of your hand where the bangle has to be pulled over; then I can size it for you. All of my bangles are closed and can’t be opened. Therefore, they have to fit over the hand. This gold friendship bracelet set or silver friendship bracelet set created and hand crafted with great care and love for you and yours. All of my items including these custom friendship bracelets are special handmade creations that are original Frosted Willow designs. I hope you love your personalized friendship jewelry set! 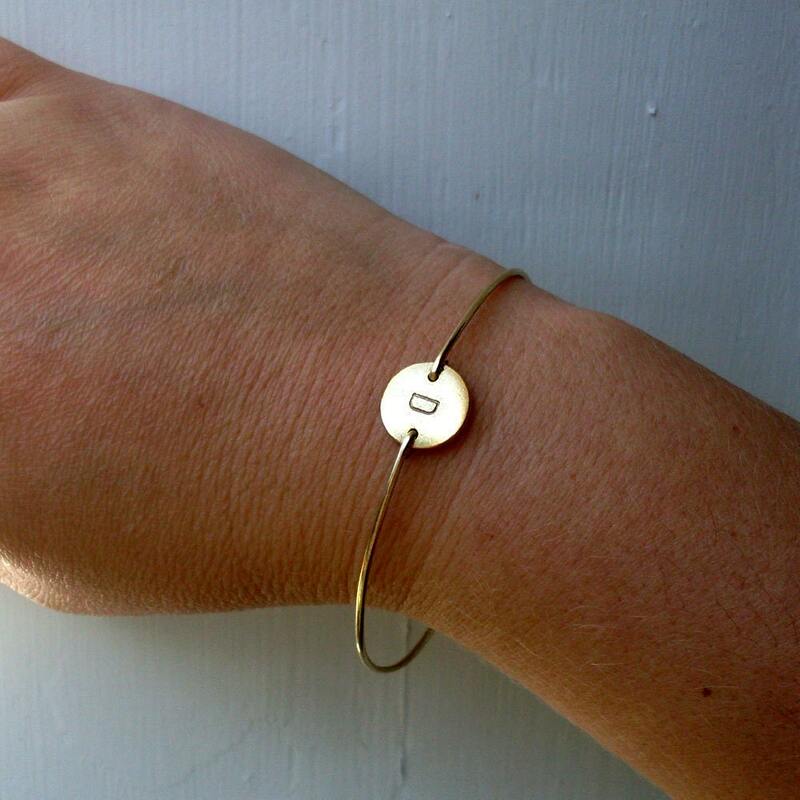 Dress up your Bracelet™ - Be sure to mention the initials you want for the front and back of your best friend bracelets in "notes to seller" during checkout.